(Bloomberg) -- Insys Therapeutics Inc. founder John Kapoor was so determined to get back the millions he spent launching the company that he led Insys on a disastrous path of pushing its addictive opioid drug on patients who didn’t need them, according to his former chief executive officer, Michael Babich. The way Kapoor ignored his subordinates, “you really don’t want to push back because once he makes up his mind, the decision is done,” Michael Babich told a Boston jury at Kapoor’s racketeering trial on Tuesday. His demands contributed to a shift in marketing strategy after the company’s fumbled launch of its Subsys painkiller in March 2012, Babich said. Kapoor ripped into his underlings, calling it the “worst [expletive] launch in pharmaceutical history he’d ever seen,” according to Babich, who worked with his boss for 14 years. Kapoor sought to fix it by setting up a bonus system for sales representatives that encouraged them to woo physicians to overprescribe the drug, Babich told jurors. It apparently worked. 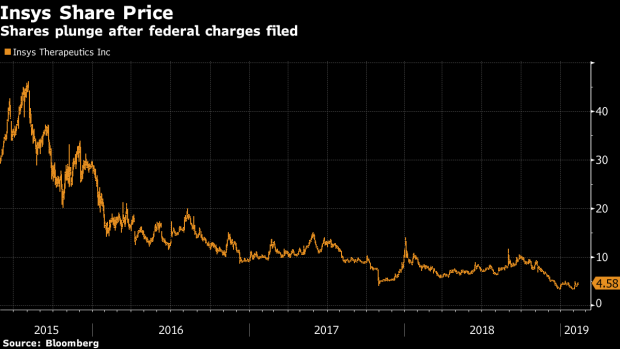 Quarterly prescriptions for Subsys in the U.S. surged to almost 15,000 in three years, with Insys’s stock price peaking at $44.92 in 2015, compared with less than $5 two years earlier. That was enough to make Kapoor a billionaire. Since then, Insys’s share price has plunged 90 percent. Babich is one of the government’s star witnesses in the case against Kapoor and other executives, who are accused of conspiring to bribe doctors with phony speaker fees and duping insurers into covering Subsys prescriptions. Babich and Insys’s former sales chief Alex Burlakoff have pleaded guilty to charges tied to Subsys marketing and agreed to testify against Kapoor and the others. Neither has been sentenced. Other witnesses have testified that Insys officials set up the speakers program to reward heavy Subsys prescribers, who got paid whether any of their physician colleagues attended the events or not. Under federal regulations, there must be at least two doctors at such events for them to be considered legal. “We achieved some success with certain doctors by bribes,’’ Babich testified. He also admitted that he knew subordinates provided “false and misleading statements to insurance companies’’ about the patients getting Subsys prescriptions. The drug was approved for cancer patients with “breakthrough” pain, but jurors have previously been told by other witnesses that Insys representatives pushed doctors to prescribe it to people with arthritis, depression and back pain. Babich, who went to work for Kapoor as one of his personal money managers in 2001, grew to know the health-care entrepreneur well. Kapoor had spent $60 million of his own money to get Insys off the ground. The Boston trial ended early Tuesday, as the city got hit with a snow storm. Babich walked off the stand without looking at Kapoor or the other defendants. He’s due back Wednesday to continue his testimony. The case is U.S. v. Kapoor, 16-cr-10343, U.S. District Court, District of Massachusetts (Boston).